NatureWorks Applications Open For 2019! Does this sound like a perfect opportunity for you, or a young person you know? The application for NatureWorks 2019 is now open! Apply today! Camp SunSplash is an environmental education camp held at Fairground Park. 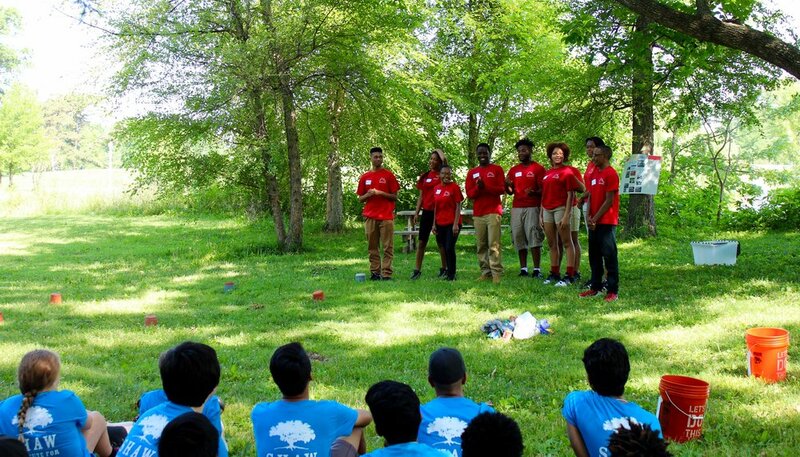 They employ teens to run their environmental education programming for campers. Check out what Fatima (a counselor) and Donisha (a camper) have to say about their summer experiences! Getting up close and personal with a turtle! "Hello! My name is Fatima Ndon, I am 16 years old and a Junior at Vashon High School. I am also a camp counselor at Camp SunSplash, and we are outside all day, every day with the sun beaming down our backs. So far my experience at the camp has been pretty good, I have built some type of close connection with each camper. By the end of summer, I want to be able to learn more about science. It’s not my strongest suit, but I am willing to do what I can to help prevent any problems and come up with a solution. One problem that I have heard of multiple times this summer has been food access. Not many people have the money to provide for their families and I think others have started to realize that. This summer I have seen many trucks outside on vacant lots or in public parks giving out free food to people who can't afford it. I am hoping that this will keep happening over the next few years!" "My name is Donisha Dukes. I am 12 years old and I go to Rockwood Valley Middle School. My favorite thing to do this summer was swimming and going on field trips. I attend Camp SunSplash, where we go swimming at Fairground Park and take our field trips by metro. One field trip I will not forget, is when we went to the Botanical Gardens to learn about how we harm our environment with pollution and cutting down trees. I learned about recycling and waste management. I found out how to stop littering and create local farmer’s markets. It would improve world hunger and the world would be a better place. We talked about creating better means of transportation, like riding the bus or bike to cut down our carbon count. I believe if people do those things we could change the world and our water would be cleaner. For the rest of the summer, after camp, I will continue to tell others about recycling and hopefully enjoy long days filled with swimming." Campers and counselors rollin' down the riverfront! 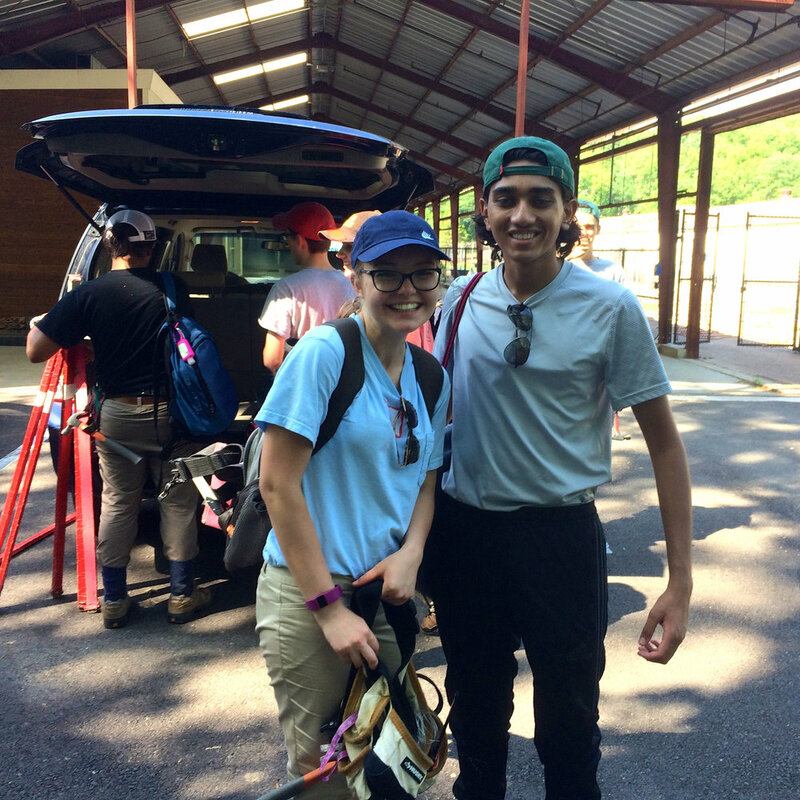 "The OYC is the Best Crew I Have Ever Had"
The Outdoor Youth Corps is still rockin in the second to last week of the summer! Below are some pictures of the wide range of community projects the OYC has been working on, and some reflections from the crew. 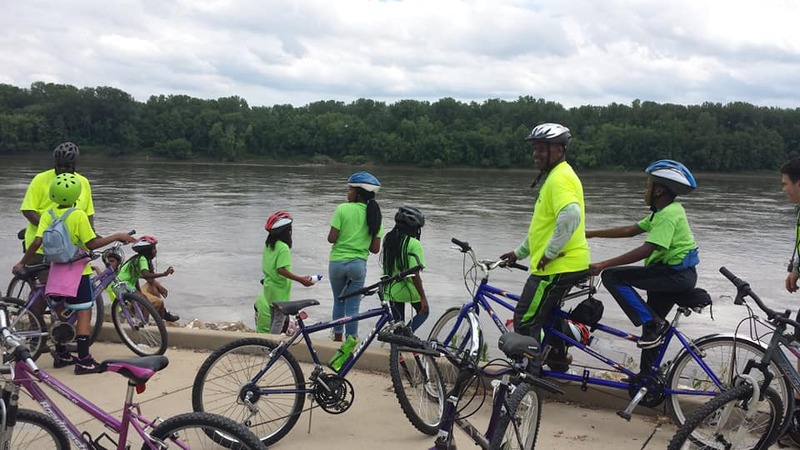 From O'Fallon Park to Greenwood Cemetery, this crew has been restoring beauty, ecology, safety, and peace to green spaces that have been neglected for too long. Invasive bush honeysuckle’s got the OYC crew up against the wall in O’Fallon Park, but they won’t back down. Vic Tabor and Jamar Watkins on the scene, you know what I mean? These cousins have this shrub invader shaking in its roots. Times up, OYC putting in work in O’Fallon Park. Learning from the best at Shaw Nature Reserve, Grey Summit MO. 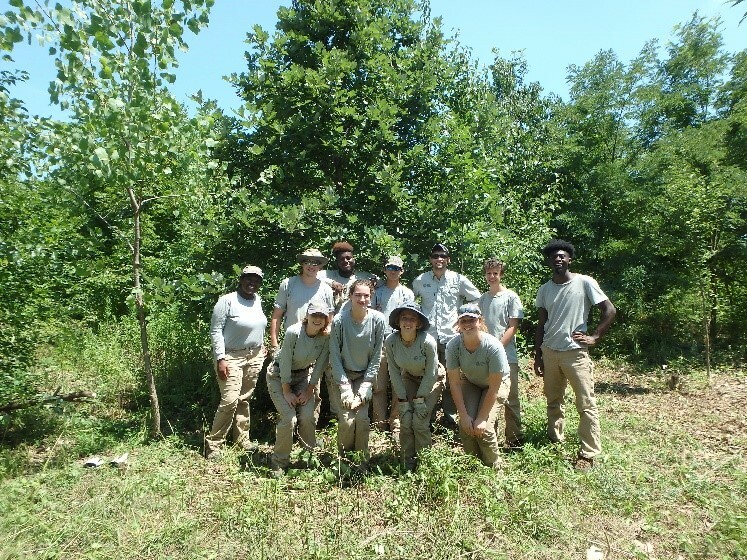 Ecological Restoration Specialist, Mike Saxton, shows the Outdoor Youth Corps the ropes, collecting native seed to restore ecosystems throughout the preserve. Heads up! Teamwork made the dream work at Greenwood Cemetery in North St. Louis County. Dragging, cutting, pulling, and ripping our way to a better understanding and appreciation for this historical and cultural gem in our community. Click the post title to read the full article. Way to go NatureWorks! This is the very first year of Forest ReLeaf's Tree Tenders program! Forest ReLeaf’s Tree Tenders program is closing out its fourth week, and things are going “Tree”riffic! Over the past few weeks, we have not only spent time with trees, but have helped others in the community with their gardens, meadows and parks. 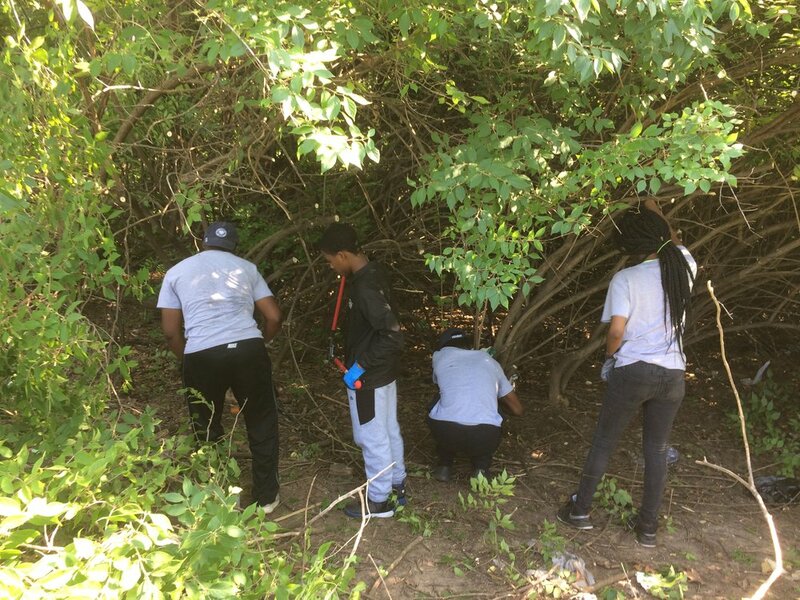 To kick off the program, the teens were introduced to tree identification and learned how to look at leaves to determine what species of tree they were looking at. Working with the Forest Park Arboriculture crew, we were able to assist in brush clean-up after they cut down a large black cherry and an extremely old oak. So far, this was one of the crew’s favorite projects! 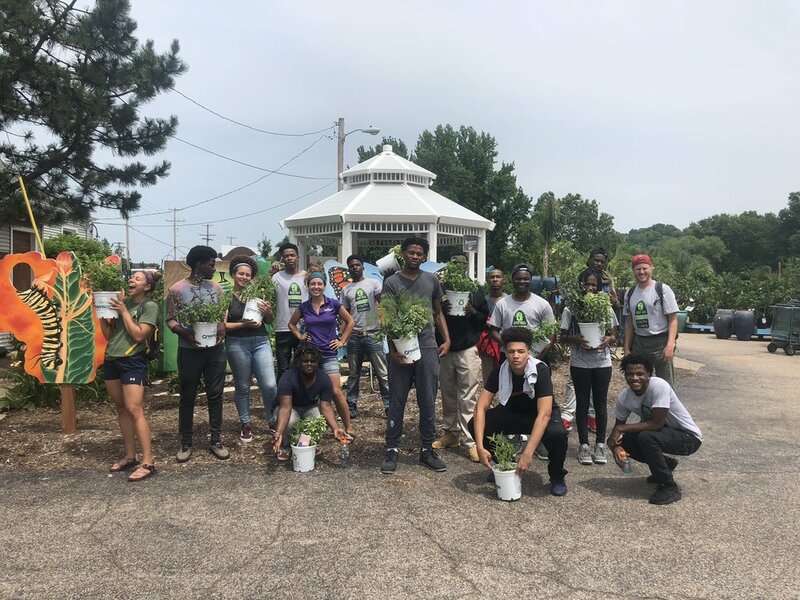 Additionally, we have learned how to identify and remove invasive species at Bellefontaine Cemetery and O’Fallon Park, potted herbs at Greenscape Gardens, mulched and watered trees in St. Louis City Parks, and potted seedlings at Forest ReLeaf’s CommuniTree Gardens Nursery. The first month has flown by and the Tree Tenders are excited to learn more about urban forestry in the coming weeks! The Tree Tenders program is a partnership between Forest ReLeaf, the City of St. Louis, and the Funders’ Network. 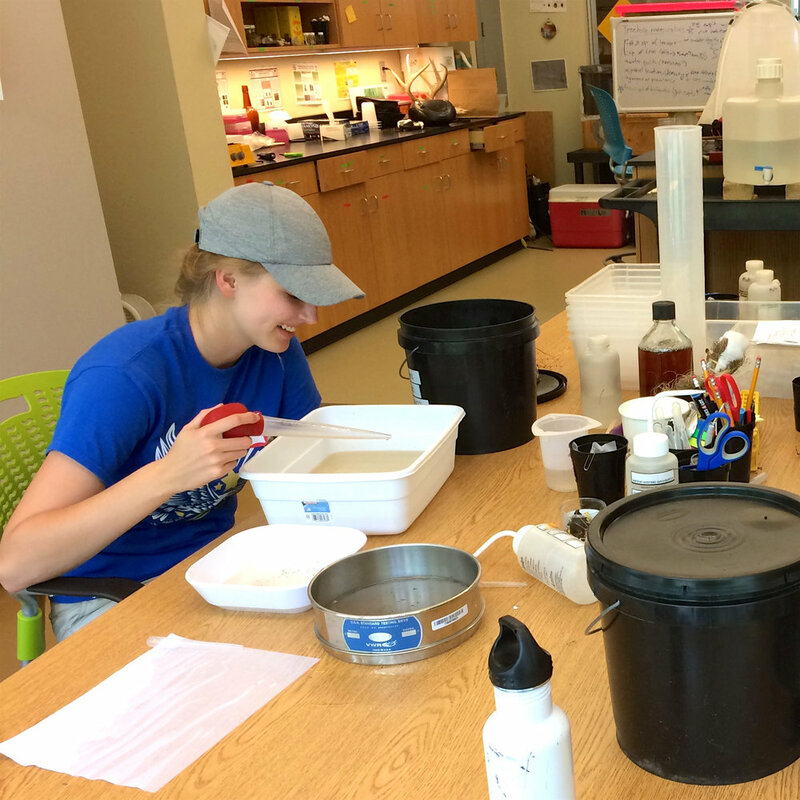 This summer, six teens from the Saint Louis Science Center’s YES (Youth Exploring Science) Program are teaching classes at the South City Family YMCA. Alana, Adrionna, Dayshia, Ayianna, AJ, and Quadlyn (that's me!) lead groups of kids at the summer camp in gardening, exercise, and healthy eating activities on weekdays. Each day, the teens teach a group of up to 35 kids for three hours. 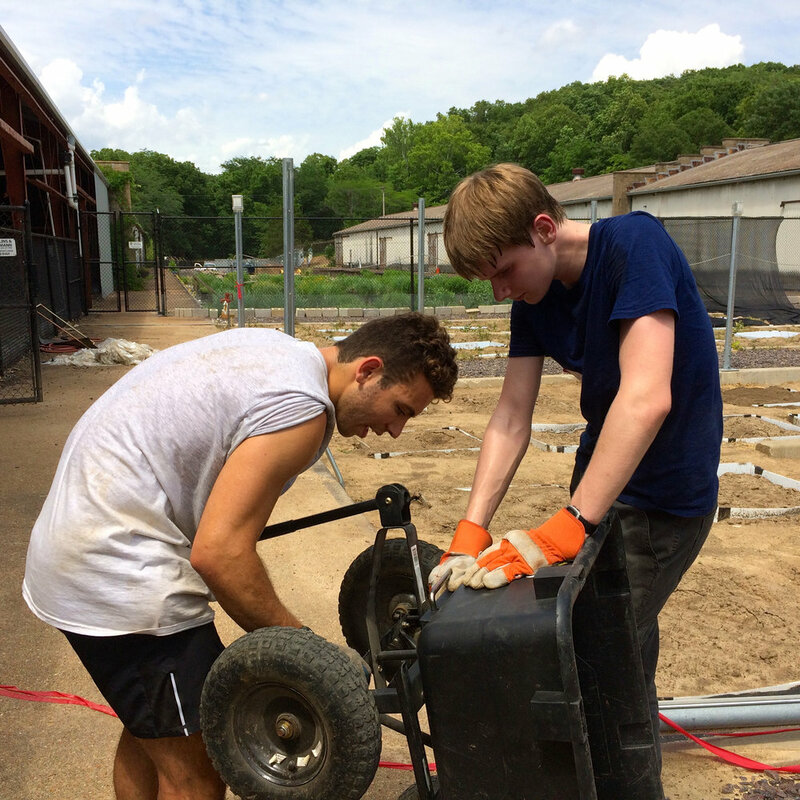 The teens have helped to improve the garden at the YMCA and teach the kids how to take care of it. The kids weed, water, transplant, and harvest the plants. They have learned so much about bees, tomatoes, and mint. One of the best things has been letting the kids try the mint for themselves, right out in the garden. Many kids are surprised that people eat leaves! Once the kids come back in from the garden, the teens do exercise games with them in the gym and teach them lessons about plants. But the highlight is always the healthy snack. One of the most popular is rice cake pizzas. Want the recipe? 1. Step one is to take the kids out to the garden. After they water their garden, have each child pick one basil leaf on the way back inside. 2. Once inside, wash the basil leaves and have the kids tear them into little pieces on a plate. 3. Next give each kid an unflavored rice cake. Teens go around and put pizza sauce on each rice cake for the kids. 4. The kids sprinkle their basil bits onto the pizza sauce. 5. Next, other ingredients can be added: mozzarella cheese, broccoli, pepperoni. 6. Voila! A rice cake pizza. If you make it at home, you can also microwave it for 20 seconds to melt the cheese. Not only are the kids making a fun, healthy snack, but they are also learning about herbs and using spices to flavor food instead of fat or sugar. You can extend this recipe into so many lessons about herbs. The teens have been doing a great job teaching the kids. They are great mentors and have been encouraging the kids to try new foods. Every day, they feel like they have accomplished something by teaching the kids to enjoy being outdoors and eat healthy. We can't wait to see what the rest of the summer holds! YES teens about to drop a hilarious and fun recycling and composting activity at the 2018 Green Teen Alliance Base Camp. This is the first year YES has officially joined the Green Teen Alliance, and we're so glad they're here! Forest Park Forever: Meet NatureWorks! Hi everyone! This is The Forest Park Forever Nature Works Crew. 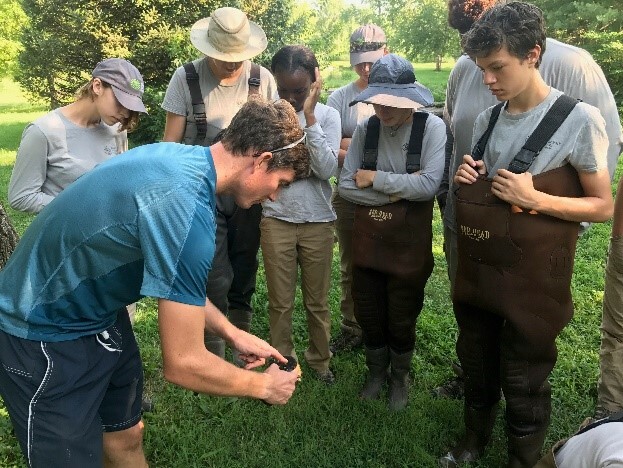 We work in the Forest Park waterways and the surrounding area maintaining, improving, and restoring Missouri’s native species while eliminating invasive species. Nature Works is a teen youth program aimed towards giving students the opportunity to learn and better the environment. We are a group of teenagers from the St. Louis metro area ranging from the ages of 16-18. The following was first published on the Gateway Greening blog in August of 2016. As all our programs reflect on our 2017 summer, we keep coming back to the opportunity to do rigorous work together- physically, socially, emotionally, even spiritually- as what we are most grateful for. Dig It crew members are on the home stretch, with only 1 week to go before their summer jobs are over. They have done some HARD physical work, jobs that would make adults cringe and retreat into air conditioning. Last week, we harvested 6 rows of potatoes at La Vista Farm in Godfrey (in addition to rows and rows of tomatoes and carrots). It was 95 degrees, and crew members were crawling through the soil filling up buckets behind the potato digger. Some potatoes were rotten, and when crew members grabbed them, the liquefied potatoes exploded onto their hands. We were sweaty, stinky, and coated in potato goo and a thick layer of dirt. Naturally, crew were complaining and moving pretty slowly by the end of that job, and the crew leaders had their work cut out for them to keep the group motivated and working. We stopped to eat lunch, and after lunch we had about 20 minutes before we needed to leave. The farmer gave us some options: either we could leave then, or we could speed pick green beans for a few minutes. Without hesitation (okay, maybe with a little hesitation), our crew went out into the beans. I was incredibly proud of them. This is what it’s all about- being willing to help somebody, to do it well, and to finish the job with a positive attitude, even if it makes you sore and hot and uncomfortable. However, this is not the hardest work we’ve done this summer. The most challenging task Dig It takes on, from the day they start until long after they finish, is the task of building a loving and supportive community from a group of strangers. Many adults comment to me that Dig It reminds them of day camp, and that it doesn’t seem like a real job. They don’t usually mean this in a negative way– they just notice all the games we play every morning, or the time we spend talking and reflecting, and understandably make an assumption that those things don’t count as work. True, building community is not usually a central task in our day jobs, but that doesn’t mean it isn’t work. From the first day of Dig It, we push our youth to open up and share things about themselves with the group. We push them to treat each other with respect and dignity. We help them find strategies to resolve conflicts with other crew members. We play games every day to practice our group problem-solving skills and to build trust with each other. We train them to ask each other if they need help. If someone is working alone, ask if they want some company. Hold each other accountable– if a friend is slacking off, remind them that we’re here to work. We learn about how social structures like racism and sexism affect our individual group, and we take steps to hold ourselves to a higher standard. Given the choice between picking slimy potatoes in the heat or doing this community-building work, I think many adults would choose the potatoes. But out of all that community building, we get a group of young people who take care of each other, and can accomplish any task while honoring the opinions and ideas of each individual. There is no shortcut to this outcome. No amount of money can buy a loving and supportive community. You’ve got to do the work, every day, even on bad days. It won’t be easy, but it will be worth it. Our crew has truly shown up for each other and done that work, and it’s not the kind of thing you can un-learn.